We were travelling to Thailand and Vietnam with you in March. The 30 days trip you created for us was spot on. It is quite ambitious and hectic for some but it worked out very well for us. Thank you for respecting our original itinerary. 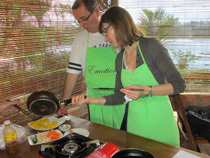 We particularly enjoyed the tour at Emotion Perfume River and the cooking class. My, our guide was incredible. We think that we would be interested to learn cooking noodle too, very nice meal we don’t have in Italy. For Thailand part you can see more photos on Facebook. Truly memorable time.